Remember that commercial for dog treats that was pretty much just a dog who, in heated inner monologue, yelled “BACON” over and over again? Well, it would appear that someone over at McDonald’s exists in a similar headspace. To celebrate all the bacon McD’s is throwing onto its menu, the fast food giant will conduct a Bacon Hour. 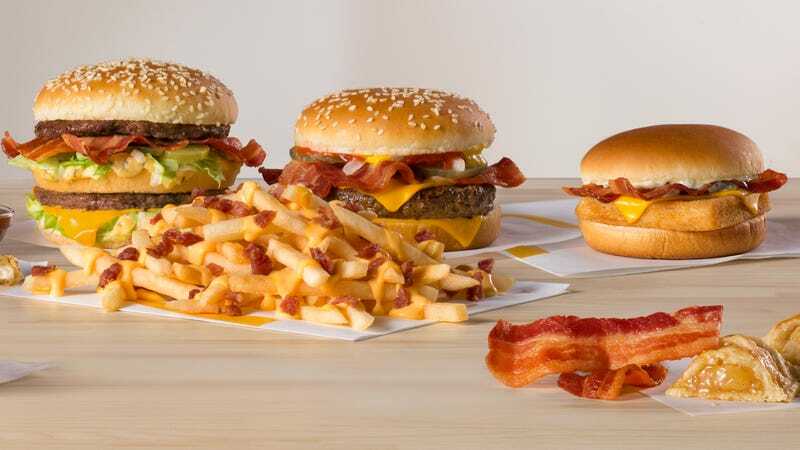 On Tuesday, January 29, from 4 p.m. to 5 p.m. (local time), one can visit one’s local participating McDonald’s and get one order of applewood smoked bacon—that’s two half-pieces of bacon, to be specific—with anything on the menu. Much also depends on the crispiness of the bacon. Say you want to get a sweet menu item. If you get, say, a caramel sundae, a piece of crispy bacon could be a weird salty spoon for you to use, since the ice cream is so soft anyway. But if the bacon isn’t crisp enough to be load-bearing, it might work shoved inside an apple pie. Hear me out here: Take a bite of the pie. Slide the bacon into the opening of the pie. Maybe bend it so that it matches the curve of the side of the pie. Or if that’s too messy, maybe just take soft-serve and use it as icing on the pie, then put the bacon on top. And of course, if it’s really crispy. you could crumble it up on top. “When we said there’s no such thing as too much bacon, we weren’t kidding. January 29, we’ll be upping the bacon ante—the bac-ante, if you will—and celebrating this glorious food favorite like never before,” said Chef Michael Haracz, McDonald’s Manager of Culinary Innovation. McD’s, you’re good at fries and stuff, but that pun? We are bah-dah-dah-bah-dah NOT LOVIN’ IT. We gladly offer our services as pun consultants; please be aware that our fees are exorbitant. * For the purposes of this thought experiment, we are assuming no one is going to cook their own bacon, bring it to a McDonald’s, and add it to the food. But hey, you do you.